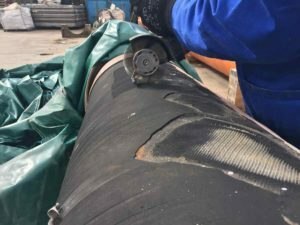 Rubber Repair and Protection system ensured this critical piece of equipment was repaired and ready to return to offshore operation rapidly. 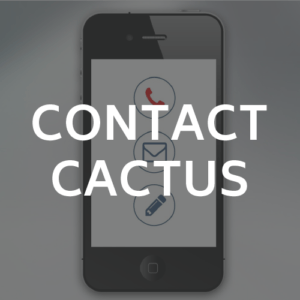 When a client detected significant damage to an offload hose, Cactus technology was used to quickly and effectively repair the hose. Our system also extended its operating life. 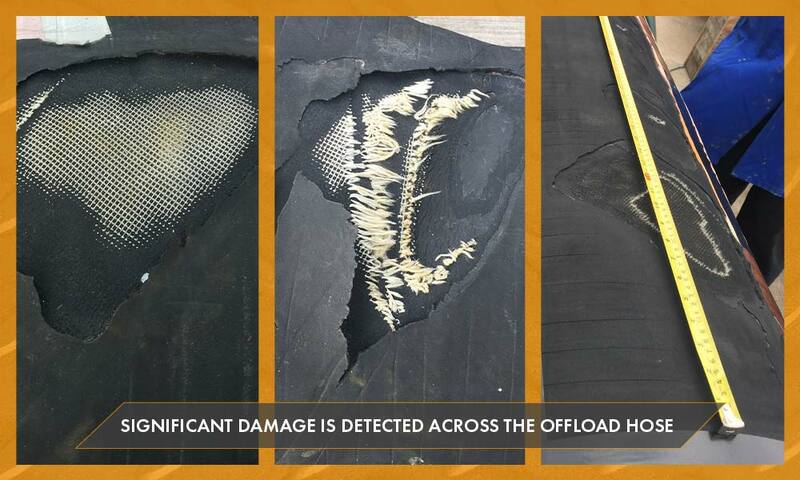 The outer rubber sheath of this Floating Production Storage and Offloading (FPSO) hose had become badly damaged while the hose was being reeled in and out of storage. This large diameter hose is a critical piece of floating equipment. 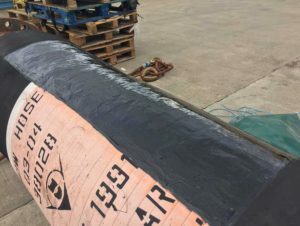 It sits underwater and is connected to an offshore oil well where it’s responsible for pumping thousands of barrels of oil onto a tanker. When this equipment is out of use, the whole operation is closed down. The first stage of any repair project is to ensure the surface is adequately prepared. 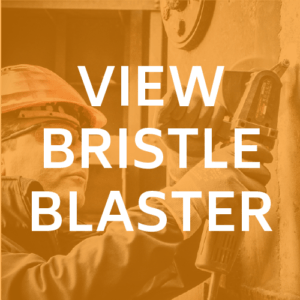 The Bristle Blaster is a high performance hand-held surface preparation tool. It combines the ability to produce an abrasive blasted finish with the high mobility and flexibility of a portable hand-held tool. Excess rubber was cut away and the damaged surface and surrounding area Bristle Blasted. 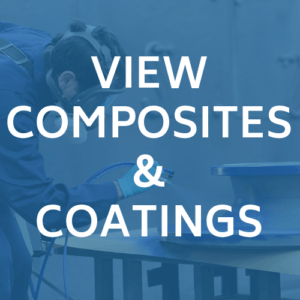 The primer is mixed easily and quickly applied to the areas that have been Bristle Blasted. 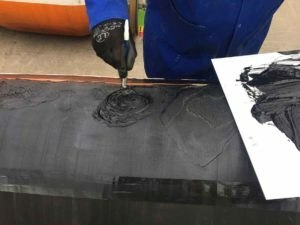 The 2 part liquid polyurethane material is initially applied to the damaged areas and is then applied to the remaining Bristle Blasted surface areas. It’s a flexible solution that is shaped to the circumference of the hose. 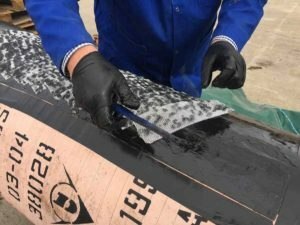 A reinforcement matting is applied to provide an enhanced bond between the Rubber Repair polyurethane and the rubber substrate. 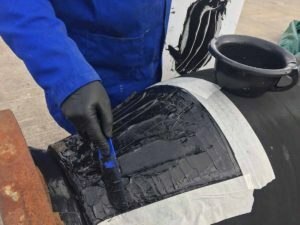 An additional layer of the liquid polyurethane rubber repair material is applied on top of the reinforcement. 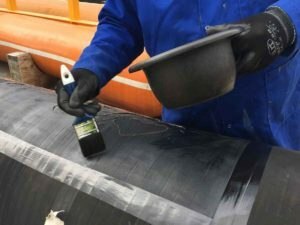 An additional layer of the liquid polyurethane rubber repair material is applied on top of the reinforcement. Just before this application completely cures, light sprinkles of water are used as the material is finally smoothed by hand. 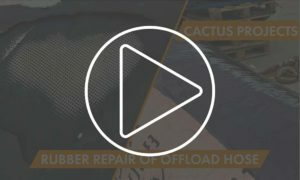 Click the image above to watch the video from our Offload Hose Rubber Repair project.